This weekend we visited our local Whole Foods Market Brew & Brau Pub intending to try the Big Poppa Biggie S'mores Imperial Stout produced by Charlottesville's Three Notch'd Brewing Company. Unfortunately, their tap system had failed, so it was time for wine. 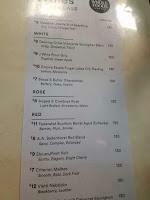 Examining the wine list, I noticed several possible local wines from New York, Oregon, and Mendocino in California. After returning home and further research yes, the grapes were indeed, mostly sourced from within local wine regions, but not necessarily estate driven. There isn't much information about the wine except that it is a blend of Chardonnay and Pinot Noir using American grapes. Thus not a local wine except it is apparently made by Gruet Winery even though the winery doesn't list it on their website. In any case, it is a delicious sparkling wine: creamy apples and depth. Empire Estate sources fruit from across the Finger Lakes - a cool climate region well known for their Riesling production as it is very similar to Alsace and Western Germany. (See Viticulture in the Cold Climate Finger Lakes) This wine is excellent, dry with racy minerals, some petrol. and uplifting acids. Elouan is a brand that sources their grapes from three terrains in Oregon’s Western vineyards that are well suited for growing cool climate varietals. The first is the NW region - most likely including the Willamette Valley AVA -- with a temperate climate and cooling marine influences. The second is the West-Central Hills consisting of diverse microclimates through the many mountains and valleys. And finally, SW Oregon, where the elevated landscape and volcanic soils are derived from the convergence of three mountain ranges. The grapes were fermented separately, blended, then aged ten months in a mix of new and seasoned French oak. The result is fantastic: the cherry fruit turns to chalky dirt with a long lingering tail. Part of the Terlato Wines family, Federalist Vineyards produces several wines from throughout The Golden State. This Alexander Hamilton labeled wine is a blend of Zinfandel, Petite Sirah, and Merlot sourced from Mendocino County and aged six months in American oak and finished six months in bourbon barrels. The later barrels impart noticeable vanilla, baking spices, and caramel with the dark black fruit rounded out by approachable tannins.